Yes, Marie Le Pen and her anti-immigrant party won enough votes to head toward a runoff. She will face the centrist Emmanuel Macron. And, yes, the Alt-Right Media predictably gloated that another country is falling to the populist movement. But oddly, even as the results became clear, the Red Media fixated on a side note: Three days before the election, Macron got a call from none other than a private citizen named Barack Obama. Obama said the call was not an endorsement. but perhaps because the Mainstream Media had reported that both Russian trolls and President Trump himself (through Twitter, of course) were trying to help Le Pen, the Red Media went into high dudgeon that this was an influence story being ignored. Former President Obama continues to meddle in foreign affairs, holding a phone conference with a leading candidate in the French presidential elections ahead of Sunday’s vote, then jetting off to Germany for a joint event with Chancellor Merkel next month. Obama interfered in a foreign election to help Macron. Where is the outrage? It appears the far right has successfully taken over Hillary Clinton’s slogan “I’m with her” and made it a hashtag to support Le Pen at #imwithher. It’s going to be a brutal two weeks until the runoff on May 7. And speaking of the further crumbling of Western civilization, one of the more galling developments of the past week has been the emergence of the bomb-thrower Ann Coulter as a symbol of free speech. 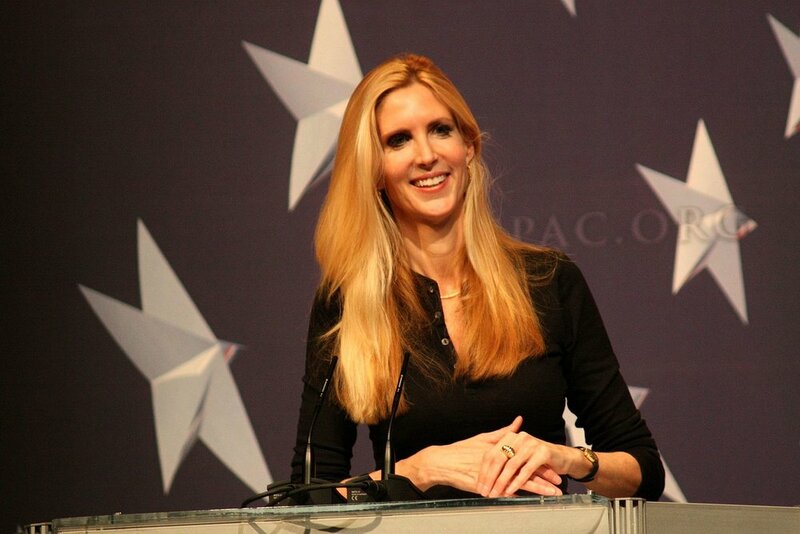 Like every other publicity-hungry right-wing pundit, Coulter booked a speech at U.C. Berkeley, where the Antifa -- a radical movement whose members have decided conservative speech is hate speech and must be stopped at any cost -- predictably protested. The university, no doubt fearing that yet another embarrassing riot would ensue, tried to postpone the speech. At which point an outcry from minor celebrities on behalf of Coulter ensued. Berkeley backed down. The Mayor of Bekeley, Jesse Arreguin supports the far-left terrorist organization, BAMN according to his Facebook page. Perhaps this is why the police were told to stand down while ANTIFA threw glass bottles, M-80’s and bricks at Trump supporters in his city. Mayor Jesse Arreguin is a member of ‘BAMN’ AKA ‘By Any Means Necessary’, a violent organization affiliated with ANTIFA. Is this something that should be acceptable for a sitting Mayor? The leader of this group is Yvette Felarca. Felarca is a middle school teacher (scary) and her group is behind much of the violence towards Trump supporters. She also works to shut down Conservatives who seek to give speeches at universities. No one really thought Papa Bear Bill O’Reilly would go gently into the night So even though Fox News officially severed ties with him last week, his personal podcast, “No Spin News,” will continue on. New episodes will be available on his website starting today. 3. Limbaugh: Trump’s Nailing the Blame Game. “My humble opinion is that the entire Washington establishment has been behaving, has been comporting themselves in such a way as to stall and delay and limit and prevent as much of Trumpism actually happening as they can, under the belief that at some point Trump’s gonna burn out, grow tired and weary of it, and either resign or the Democrats are gonna impeach him or something. Poll Watch: Trump Fans Have His Back. It is hard to tell if this strategy of shifting the blame is working for Trump. Gallup’s first quarter poll showed his approval rating at 41 percent, the lowest in the survey’s history. However, his support in his party is rock solid. An astonishing 87 percent of Republicans said they approved of his job performance -- that’s a higher number than Eisenhower, Nixon and Reagan had at the point in their first terms or the elder George Bush had three months into his only term. A Little Talk Among Friends. And to bolster his base, Politico reports, Trump will host a special reception exclusively for alt-right news outlets like Breitbart and The Daily Caller today. “They were neglected the last eight years, and they’re an important medium to communicate to a massively growing number of Americans who, frankly, have grown tired of mainstream media’s coverage,” the White House press secretary, Sean Spicer, told Politico. The Washington Post had an article full of juicy tidbits on how Trump’s obsession with cable TV affects how he perceives the world.